Colonial style houses were very popular in America from 1690 to 1830. Most Colonial homes were built by wealthy Americans in New England. 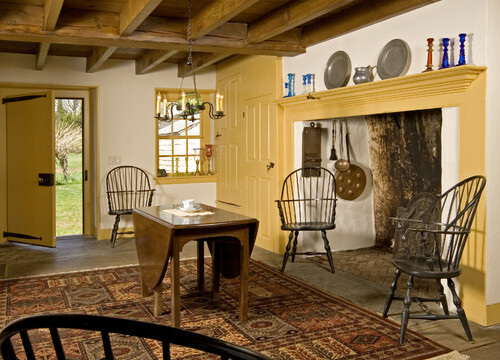 In the 1600s, a Colonial home was a one story 2 room house with a central chimney. By the 1700s most Colonial homes were two stories with 4 rooms. Today, the most popular Colonial design in the United States is a symmetrical front with a central door, two windows on either side, and five windows across the second floor. Over the years people have been adding additions to their Colonial home such as a garage, a shed, or even an in-law apartment. A Colonial home décor offers a warm and rustic look. 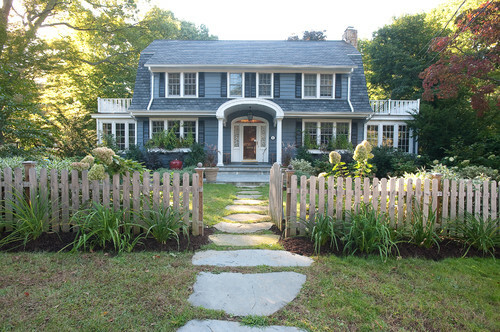 Styles change, but Colonial is still incredibly popular in New England and the North East in general. It is the most popular board on our Pinterest page. Traditional Landscape by Tarrytown Landscape Architects & Landscape Designers Westover Landscape Design, Inc.
Below are options for lighting a colonial house and kitchen. 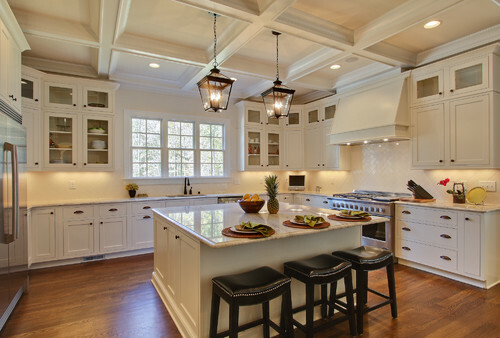 Recessed Lights – You can use recessed lights around the perimeter of your kitchen to create task lighting. You can install an eye ball or gimbal recessed trim that allows you to adjust the trim to where you want the light to hit. Pendant Lights – Pendant lights will give décor to any kitchen. It also provides down lighting on countertops for your kids to do their homework or sit and eat. 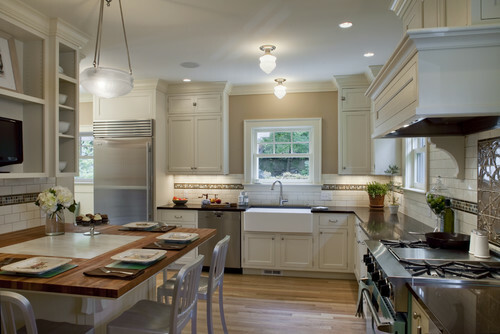 There are many options for Colonial kitchen pendant lights as well as many different finishes. 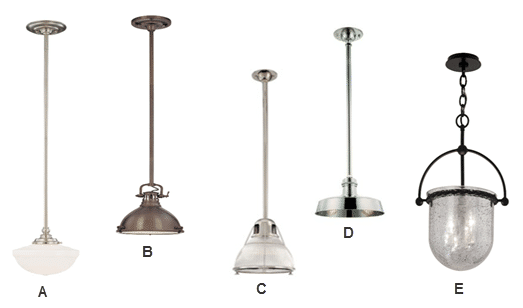 Colonial Pendants are usually hung with a stem rather than a low voltage wire. The first piece is a Schoolhouse, because it was popular in schools around the turn of the century. You see antique bronze finishes and different glass options. Semi Flush Mounts – Semi Flush mounts are ideal if you have the proper ceiling height. You can match up a semi flush mount with a pendant to give your kitchen a beautiful new look. Semi flush mounts provide general lighting in a kitchen and can also up light your ceiling. White glass is popular with just basic lamp fitters. Flush Mounts – For lower ceilings you may want to use flush mounted lights. These are lights that sit closer to the ceiling and provide general lighting in your space. Hanging Lanterns – Lanterns are ideal for kitchens with really high ceilings. They can also be used above a table or countertops for general lighting. Below are really popular pieces which emulate traditional turn of the century designs. Chandeliers – Chandeliers can be used above a table, counter, nook or in the middle of a kitchen. Exposed arms with or without glass seem to be the new/old trend. These chandeliers have become trendy in many different decors from traditional to eclectic. As you can see there are many different options for lighting a Colonial Kitchen. I would recommend a couple of pendants above the counter depending on the size of your counter. I would also recommend using recessed lighting as well as under cabinet lighting for task. For above a table I would recommend using a chandelier or lantern. Semi Flush mounts will look nice in the middle of your kitchen and give extra light. A combination of these would provide a great amount of light in your kitchen. Get the Yale Kitchen Lighting Guide with plenty of how to’s and pictures to help any kitchen project. Over 50,000 people have already found answers in a Yale guide.